Wearable in the form of smartwatches has been a big thing since 1982. Ever since then, new waves of smart wristwatch technologies are continuously making a buzz on the market. Currently, mobile tech giants like Sony, Samsung, and Google are the leading modern wristwatch producers, next to startups such as Pebble. Most tech companies have been trying to create the perfect modern watch that can perform similarly to the smart handsets we have today. However, the wrist devices we have today are only able to prompt and interact with notifications, browse the internet, and make reminders, but not as a standalone mobile gadget. Taking a look at its major milestones in history, a Seiko brand called “Pulsar NL C01” is one of the first wearables in 1982 that can only store 24 digits of information. Bluetooth was non-existent way back then and cellular hardware was far too big and expensive. Later on, the next big shift in modern wrist watches occurred with the creation of Seiko Receptor in the late 90s followed by Samsung’s SPH-WP10 that was regarded as the first watch phone. IBM and Citizen followed the trend with the WatchPad, but unfortunately, it was short-lived. Fossil’s Palm OS though managed to last longer by being able to provide the same features in a more compact gadget. Since then, there are loads of attempts to create the ideal smartwatch including Microsoft’s Smart Personal Object Technology (SPOT) that was used for FM broadcasts. However, it didn’t appeal that long due to its little features. By the beginning of the year 2009, Samsung had its S9110 Watch Phone, and then Sony Ericsson followed through with its launch of LiveView in 2010 that pulls data from Android phones. It was by the end of 2012 that we were presented with modern wearables that are able to work with our smartphones and provide heart monitoring features. It was during that same time that the Nike+ Fuelbands, Jawbone Ups, the e-paper-screened Pebble, the cute Cuckoo, the Sony SmartWatch and all kinds of GPS trackers and exercise monitors were created. And before this year will end, there’s the Apple’s iWatch which is predicted to be the game changer of modern mobile technologies. While many of these devices released have that potential to stand out among the rest, there are relatively a few that nailed the top of the wearable tech list. Their functionality and designs may vary, but the main feature of a smartwatch to deliver notifications to your wrist (including calls, texts, email and social updates) remained. But, we should be expecting more than the basic features on the next wave of modern watches. Based on reports, Samsung is serious with its Galaxy Gear series as it created further enhancements with its products like Gear Fit, a fitness band that’s tethered to a Samsung device, and the Gear S that runs separate from a phone and comes with its own SIM slot. 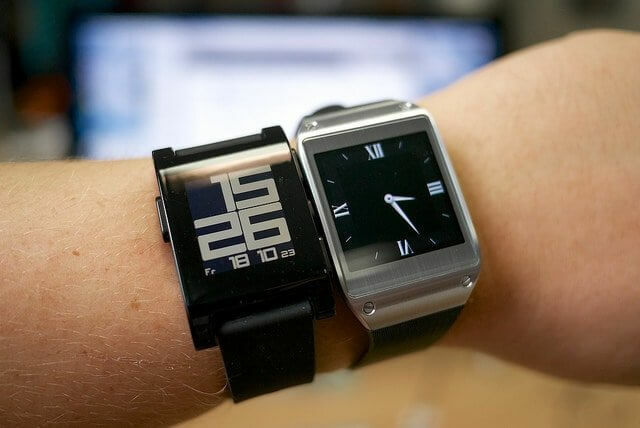 But, a notable smartwatch that made an impact in the industry is the Pebble. This is perhaps the most significant device released with its idea of low-energy “e-paper” display that could last an entire week on a single charge. Google’s intelligent new device, Android Wear, also was highly recognized on the market with its distinct features of glance-powered notifications and accurate voice search. However, the biggest mobile contender, Apple has jumped into the modern watch craze with its very own Apple Watch (iWatch). Its surprise announcement along with the iPhone 6 and iPhone 6 Plus created a huge buzz around the world. This very stylish wearable comes in distinctive designs and features more than just timekeeping. It lets users connect and reach out in more ways than one through message or call. But, we expect that it will come with similar sketch functionality and built-in heart rate sensor like the other devices. So far that wraps up the whole new mobile market at the moment. Indeed, smartwatches improve every person’s lifestyle in so many ways by helping you track your health and fitness, answering your phone, displaying notifications and many more. Smart wristwatches are regarded as mere accessories to mobile phones and not as standalone devices. Hence, experts think that smartwatches won’t be taking over smartphones for the foreseeable future yet. However, we can still expect that more tech companies will be gearing into this direction. This article was published in Technology and tagged Gadgets, Smartwatches.